There's something I assumed everybody knew, but many were choosing to ignore. You see it everywhere. Emails and forwards sent to large groups of people, or even entire mailing lists, with everyone's address exposed and naked in the glow of the computer screen. In addition to this, there are often several chunks of addresses and other gunk to scroll through before you even get to the message you may or may not be interested in reading. I get a lot of email, so I get a lot of forwarded stuff, and to be honest, I usually delete these without reading them, especially if they're sent in a sloppy manner. As I said, I assumed everyone knew how to send a group email, but more than one friend has asked me how to do this recently, so I began to wonder. I have very smart friends, so if they didn't know, it follows that a lot of other people also don't know. I can help. First of all, please stop forwarding email warnings of Terrible Things. They're almost always hoaxes, designed to keep us living in fear, and we really don't need to participate in that. If you think something might be of valid concern, please check it out on one of the many hoax-exposing websites first. Two of my favorites are Snopes, and HoaxBusters. If you find something you really need to warn all your friends, family, and acquaintances about, or if you just have to share those pictures of cute furry animals, or the latest holiday jokes, the next step is to do it respectfully. Nobody wants their email address made available to the entire world, which can happen if an email gets forwarded many, many times, and wanders into the hands of countless total strangers. 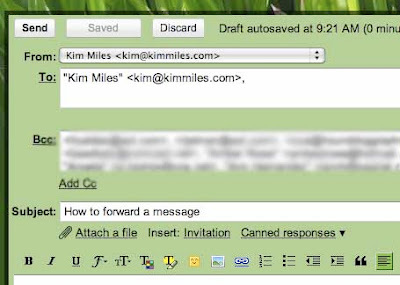 First I'll explain how to send an original email of your very own to a group of people. Write your email, attach your pictures or whatever, and proof read it so you sound smart and thoughtful. A great trick is to read it out loud to yourself, which really helps you hear how it will sound in your reader's heads. When it's ready to go, address it first to yourself, and only yourself, in the "To" box. Then add everyone else's address in the "Bcc" box. This is a Blind Carbon Copy, which hides all the addresses from everyone who receives the email. A brilliant invention, so polite and civilized. The process for forwarding is basically the same. Click "forward," and again put only your own address in the "To" box, and all the others in a "Bcc." Then highlight and delete all the clutter at the beginning of the message, like addresses that were attached to it when it was sent to you. Clean it up before you send it! It only takes a few seconds. Simple, yes? I hope I've been of some public service today. Happy emailing to you! Thanks so much for posting this information. Thankfully, I already knew. . . but don't know how to politely tell those who allow me to see many email addresses I have no need to know. I, too, delete most forwarded stuff - just don't need it. I use MS Outlook for email and it does not have an option for Blind Carbon Copy. I really wish it did, but I rarely forward that junk anyway. Perhaps that's the problem with some of the ones you receive. Oh, stupid me. Please disregard that last comment. I just found the BCC on MS Outlook, but they didn't make it easy and it's not automatic on every email - you have to go look for it and check a box. Ugh. Sorry. It is funny how many people in this highly technological age don't know this stuff. I have told numerous people to not send me this "forward or else" garbage, and snopes is my best friend. That poor Penny Brown...lol. Too funny but so true! I threatened a colleague of mine once to have the "forward" option removed from her system!